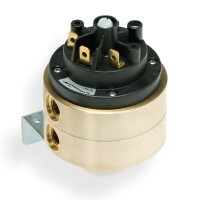 The 630 series differential pressure, vacuum and overpressure switches are suitable for monitoring neutral and slightly aggressive liquids and gases. Switching element isolated from medium. Ideal for use as flow monitor in sanitary piping/ heating installations or for level monitoring in general in process technology applications. Extremely rugged construction with high functionality due to10/20 bar safety margin in both pressure chambers.